Cur­rently approx­i­mately 600 species might be inac­cu­rately assessed as non-​threatened on the IUCN Red List of Threat­ened Species. More than a hun­dred oth­ers that couldn’t be assessed before, also appear to be threat­ened. A new more effi­cient, sys­tem­atic and com­pre­hen­sive approach to assess the extinc­tion risk of ani­mals has shown this. The method, designed by Rad­boud Uni­ver­sity ecol­o­gist Luca San­tini and col­leagues, is described in an arti­cle pub­lished on 17 Jan­u­ary in the jour­nal Con­ser­va­tion Biol­ogy. Aye aye (Dauben­to­nia mada­gas­carien­sis) in the wild, one of the many Mada­gas­can species under threat of extinc­tion. Using their new method, the researchers’ pre­dic­tions of extinc­tion risks are quite con­sis­tent with the cur­rent pub­lished Red List assess­ments, and even a bit more opti­mistic over­all. How­ever, they found that 20% of 600 species that were impos­si­ble to assess before by Red List experts, are likely under threat of extinc­tion, such as the brown-​banded rail and Williamson’s mouse-​deer. Also, 600 species that were assessed pre­vi­ously as being non-​threatened, are actu­ally likely to be threat­ened, such as the red-​breasted pygmy par­rot and the Ethiopian striped mouse. This indi­cates that urgent re-​assessment is needed of the cur­rent sta­tuses of ani­mal species on the Red List. Once every few years, spe­cial­ized researchers vol­un­tar­ily assess the con­ser­va­tion sta­tus of ani­mal species in the world, which is then recorded in the IUCN Red List of Threat­ened Species. Species are clas­si­fied into six extinc­tion risk cat­e­gories rang­ing from Least Con­cern to Crit­i­cally Endan­gered to even Extinct in the Wild , based on data such as species dis­tri­b­u­tion, pop­u­la­tion size and recent trends. It’s time for a more effi­cient, sys­tem­atic and com­pre­hen­sive approach, accord­ing to San­tini and his col­leagues. They designed a new method that pro­vides Red List experts with addi­tional inde­pen­dent infor­ma­tion, which should help them to bet­ter assess species. The method uses infor­ma­tion from land cover maps, that show how the dis­tri­b­u­tion of species in the world has changed over time. The researchers’ method cou­ples this infor­ma­tion with sta­tis­ti­cal mod­els to esti­mate a num­ber of addi­tional para­me­ters, such as species’ abil­i­ties to move through frag­mented land­scapes, to clas­sify species into a Red List extinc­tion risk category. The new approach is meant to com­ple­ment the tra­di­tional meth­ods of Red List assess­ments. “As the Red List grows, keep­ing it updated becomes a daunt­ing task. 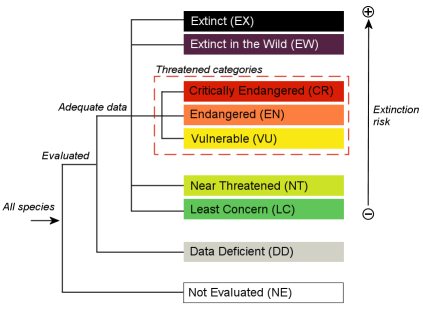 Algo­rithms that use near-​real time remote sens­ing prod­ucts to scan across vast species lists, and flag those that may be near­ing extinc­tion, can improve dra­mat­i­cally the time­li­ness and effec­tive­ness of the Red List”, says Carlo Ron­dinini, Direc­tor of the Global Mam­mal Assess­ment Pro­gramme for the Red List. The research was con­ducted in col­lab­o­ra­tion with Carlo Ron­dinini, Direc­tor of the Global Mam­mal Assess­ment Pro­gramme for the Red List, and Stu­art Butchart, head sci­en­tist of BirdLife Inter­na­tional, the Red List bird authority.